London is an incredibly popular destination that never fails to impress. Tourists from all over the world flock here to see its numerous famous landmarks, red buses, and British culture. This dynamic destination is filled with the vibrant hustle and bustle of any capital city, and because of this, getting the most out of your experience sometimes requires a helping hand. Fortunately, the days of long tours and bored tour guides are over! Now you have the power to create the perfect getaway right in your pocket. Smartphones have revolutionized the way we travel, with uncountable handy apps popping up all over the place to support and manage our endeavors with. Traveling London is no different, as the market is flooded with city guides, maps, GPS directions, and other fascinating apps to make your time in this exciting capital the best in can possibly be. Here are just five of the many on offer that can really revolutionize your time in the city of dreams! This amazing free download is available for both iOS and Android and is the fountain of knowledge for any visitor to London. It logs famous landmarks and attractions and gives you directions and instructions on how to get to them all, including an offline option so you don’t have to rack up significant roaming charges. On top of this, it also allows you to browse things to do in your area and creates Top 10 lists by relevant category. It also stores a large amount of information and fun facts about everything listed, so you can find historical, geographical, and social details of all the places you go and visit. As well as focusing on landmarks, it helps you tackle London’s notoriously complicated transport system. It tells you the best bus or tube to take wherever you’re going and even details whether or not it would be easier to walk. Finally, it has an inbuilt weather tracker and helps you create and save your own travel itinerary based on the forecast. 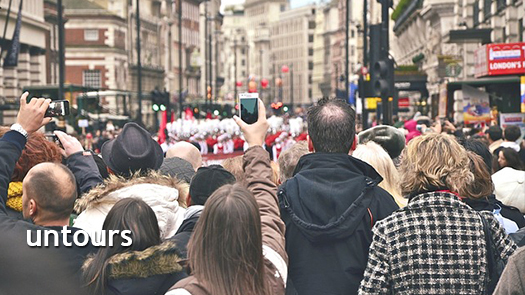 Overall, this app is the number one stop for making the most out of your visit to London. This app is a wonderfully unique and interactive extension to any tour or even simple walk around this great city. Brought to you by the Museum of London, it uses the establishment’s extensive collection of information and imagery to create a sightseeing experience like no other. Simply open the app and search for pictures near you using the GPS. Once you’ve found what you’re looking for you can open up the file on your phone and hold it up in front of your present day view of the certain street or landmark that you are looking at. This creates a historical microcosm right in front of you and allows you to compare the changes that have happened throughout history. As well as creating a truly individual and entertaining experience, the app provides you with all the relevant facts and information so you can understand the reasons for the changes. Definitely one for history lovers, it provides a factual tour of London like it has never been done before, and it’s a great way to learn about the city for travelers on a budget. You can even buy prints of your favorite pictures from the museum itself! No London app list would be complete without a tube map. The London Underground is perhaps one of the most famous landmarks in the city and not always for good reasons. It is notoriously complicated for new users and subject to constant and unrelenting changes and delays. Keeping up with the tube is a task even for those who live here. Because of this, having a handy app on your phone to help you navigate is sure to be a great help. Brilliantly simple, it allows you to plan routes all over the city and still access them when offline, which is essential as there’s no signal when underground. You can locate your nearest transport spot, work out the journey time between any two destinations, and easily re-route if there’s a problem on your chosen line. When internet access is available, you can get real-time updates of the situation, with notifications of any delays or problems that might affect you. For a first time user, this app is sure to be a life-saver when navigating London’s famous underground network. Great Little Place is the perfect app for finding all those hidden gems that often end up being the highlight of any traveling experience. With so many bars, shops and restaurants in London’s extensive metropolitan areas, it can be impossible to know which is the best to pick. Fortunately, this app can make those decisions for you! GLP is designed to create a community of users who love finding great places off the beaten track. By sharing recommendations with others, an incredible catalog has been created that can help you find local favorites all over the world. The company are extremely stringent about the venues that make it on to the app and ensure that no greasing of palms occurs, so you can be sure that all the establishments you find are genuinely loved and respected by real people. Highly-acclaimed, but amazingly still available for free, the app is a real must-have for any visit to London, as well as just being a great addition to travels no matter where you are. Using your smartphone when abroad is incredibly useful, and the rise in public Wi-Fi networks mean that it’s easy to get online for free without having to worry about costly roaming charges. However, there’s one danger to this practice that many fail to consider, and it could could lead to a traveling disaster. Like most places, cybercrime in London is on the rise, and falling victim to attack could be a disaster for you trip. Unfortunately, public networks are notoriously insecure as they leave your data flying around unprotected and visible to malicious hackers. Because of this, if you are planning to use apps to enhance your visit to the city, it’s wise that you also use a Virtual Private Network (VPN) such as ExpressVPN. The incredible app works by creating an initial secure connection between you and the VPN server before connecting you to the internet. Within this connection, your data is encrypted and your IP address is hidden. This means you can browse the internet securely and anonymously and enjoy your trip without becoming a victim to malware, online identity theft or malicious hacks! About the Author: Jess Signet is a blogger and writer that is proud to combine her two greatest loves: travel and technology. She is also interested in new technologies and the latest smartphone releases. She can’t wait for her next trip!